How did Greco-Roman Egyptian society perceive women's bodies and how did it acknowledge women's reproductive functions? 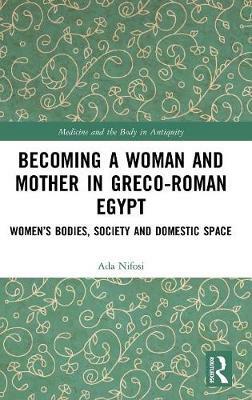 Detailing women's lives in Greco-Roman Egypt this monograph examines understudied aspects of women's lives such as their coming of age, social and religious taboos of menstruation and birth rituals. It investigates medical, legal and religious aspects of women's reproduction, using both historical and archaeological sources, and shows how the social status of women and new-born children changed from the Dynastic to the Greco-Roman period. Through a comparative and interdisciplinary study of the historical sources, papyri, artefacts and archaeological evidence, Becoming a Woman and Mother in Greco-Roman Egypt shows how Greek, Roman, Jewish and Near Eastern cultures impacted on the social perception of female puberty, childbirth and menstruation in Greco-Roman Egypt from the 3rd century B.C. to the 3rd century A.D.
Ada Nifosi gained a BA in Classical Archaeology at the University of Padua, Italy, and an MA and MPhil in Egyptian Archaeology at the University of Bologna, Italy. She was awarded her PhD at the University of Kent, UK, where she is now a Lecturer in Ancient History.